While Creative Colors International is approaching 28 years in the franchising business, our founding company, J&J’s Creative Colors, Inc., is close to turning forty – in business since 1980. Through the decades, CCI has remained a family-owned company and running a tight-knit operation has always been our way. 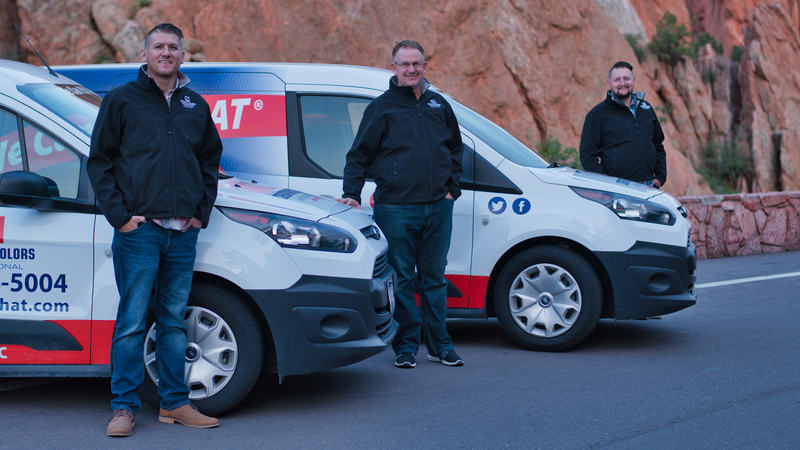 We take pride in the fact that 50 percent of our franchise owners have been with us for 10+ years, and another 25 percent have been with us for 20+ years. Our bench is also deep in the corporate ranks, as we have a history of offering attractive career opportunities which result in loyal, long-standing employees, who help make CCI an industry leader. 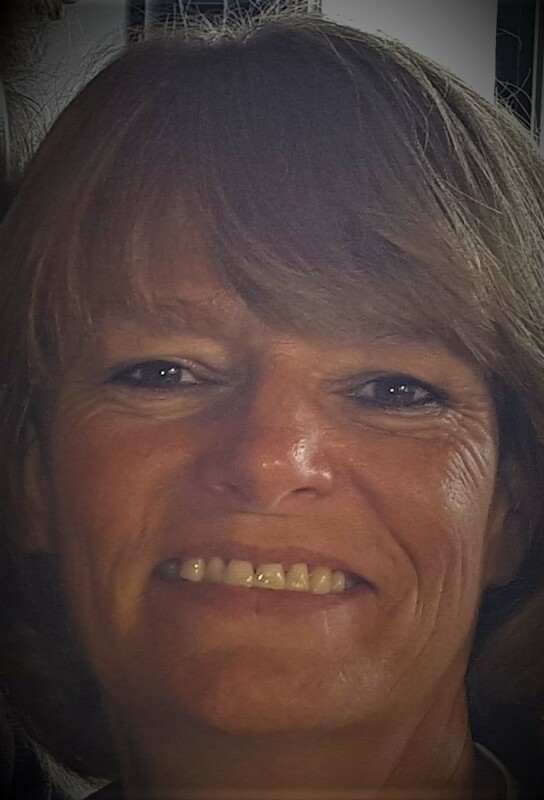 Today, we are shining the spotlight on Kathy Green-Alessi, a technician who started with J&J Colors, our predecessor and affiliate company, 30 years ago. Congratulations Kathy, on 30 years of employment with CCI! What brought you to CCI? I met one of the company founders, JoAnn Foster, at a friend’s party back in 1986. We hit it off and I think she thought I had good sales skills. She offered me a job on the spot, but I was already working somewhere else. However, I didn’t have a good boss, so after thinking about it for a few weeks, I went back and asked her if the job offer still stood and she said, “Yes!” I quit the next day and have been a technician with the company ever since. It’s the best career decision I ever made! Why have you stayed with CCI for almost 30 years? The Fosters are fabulous, wonderful people to work for. They are a family-oriented business and they care about their people. We are family to them. In 1988, I was in a major car accident and didn’t know if I would ever walk again. JoAnn came to the hospital and said, “Your job is guaranteed. Come back when you can.” Thankfully, I was able to come back two months later. When my son was born, and I wanted to spend more time at home, I was able to take time off and come back at part-time hours because it was what was best for my family at that time. And it’s not just me. I have seen them go above and beyond for a lot of people. How can you not be loyal to people like that? How can you not consider them family? I’ll stay as long as they’ll have me. I’m so grateful for the opportunity to work here. I can boil it down to three things: the work, the freedom, the money. I like the immediate gratification and results when I repair something that is damaged and make it like new. There’s a lot of pride in that. It also makes people happy because I have saved them money, so that’s cool. I also like working alone sometimes, like in a car dealership, but also having the opportunity to meet new people. One day, I spent an hour chatting with the U.S. Ambassador from Greece, when he and his entourage brought his limo in to be repaired. You don’t get that every day! I love that I can control my income and my schedule by how many hours I work. I am a hard worker, so I have done very well. When I was 25 years old, the same year I started at J&J, I was able to buy a house as a single woman. I paid it off in nine years. How many people can do that? CCI has given me the ability to do that. The opportunity is there, you just have to go get it! Are you interested in learning more about a rewarding and fulfilling career working as a Creative Colors International technician, just like Kathy? If so, please visit https://www.wecanfixthat.com/about-us/employment-opportunities/ to get started! Serendipity: An unplanned, fortunate discovery. That is how Milwaukee-based service technician Matt O’Neil could describe how his 16-year career with Creative Colors International got started. O’Neil got wind of open interviews being held at the downtown conference center where his girlfriend worked and showed up just to check things out. There he met Creative Colors President and Co-owner Mark J. Bollman, and the rest was history. 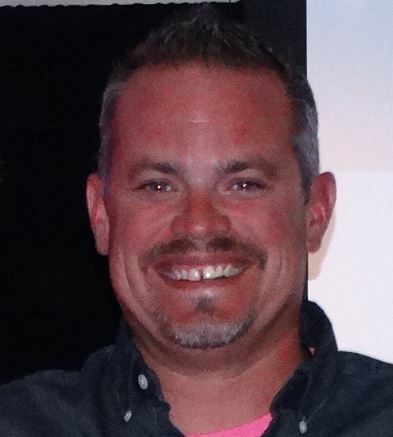 Matt has been a stellar employee for the nation’s leading on-site repair and restoration franchise for the last 16 years, providing superior service to customers on all their leather, plastic, vinyl and fabric repair needs. This month, we shine our spotlight on Matt and his commitment to CCI! What attracted you to CCI? Having grown up in the automotive industry and working as a service advisor at an auto dealership, I was familiar with the kind of work they did. The idea of repairing items instead of replacing them interested me. I was also attracted to working out of a mobile van, going new places and meeting new people every day. It seemed a whole lot better than punching in at 7 a.m. and punching out at 7 p.m. Car dealership life is rough. You’re a number. It’s not that way at CCI. It’s the best of both worlds, I’m still in the car business, but I’m not in the car business. What has kept you at CCI for so long? There are so many reasons. First, this job has grown with me. I started as a single guy just working for my own wants and needs. Then I got married, had two kids, added a mortgage. My responsibilities grew but so did my ability to make money. The income possibilities at CCI are almost endless — if you have the motivation to work. My sales have grown every year since I started. The second reason I stay is because of the flexibility and support I get from the owners. Mark, Terri and Kelli are fantastic! I can tailor my work schedule to my family, and they understand because they have families. They always put families first. When my child was born two months early and I needed time off, they said, “Do what you need to do. Let your clients know. We know you are a good employee.” There is just a lot of trust there. In addition to your work in the automotive repair industry, you have a great reputation in the marine repair industry. How did you build that? I guess you could say it’s because I am always prepared and up for a challenge. One spring, early in my career at CCI, I was knocking on doors and leaving business cards, and I randomly stopped in to a boat dealership. They just happened to have a boat there that needed to be fixed, and the service manager said, “Show me what you got.” It didn’t faze me. I had my supplies with me, and I repaired it for him on the spot. I didn’t even charge him; it was a courtesy to show him what I could do. He called me the following week with another job, and I have been working for one of the largest boat dealers in the country ever since. Plus, in the marine industry, there are a lot of word-of-mouth referrals, so I have kind of become the go-to guy for boat repairs in the Milwaukee area. Like I said, the opportunities to build business with CCI seem endless. Are you interested in learning more about a rewarding and fulfilling career working as a Creative Colors International technician, just like Matt? If so, please visit https://www.wecanfixthat.com/about-us/employment-opportunities/ to get started! When Jim and JoAnn Foster hit the streets of Chicagoland back in 1980 with a stocked van and the know-how to dye and restore vinyl,, it didn’t take long for them to see they were on to something that could be so much bigger. One van became two, then eight, then 18. By 1991, they began franchising as Creative Colors International, and gave other entrepreneurs the opportunity to create a career that rewards their life experiences and helps them achieve their lifestyle goals. Edgar has spent enough time working in corporate America that he understands how profitable a business with low overhead and high scalability can be. His background in sales, operations, or marketing, along with his growth mindset, are key ingredients in hiring and building a team that can cover a lot of ground. He may end up with 15–20 trucks or more. He enjoys managing people and always has his eye on the big picture. With multiple franchise units, Edgar could serve a metropolitan area of approximately a million or more people and develop revenues of three million or more. 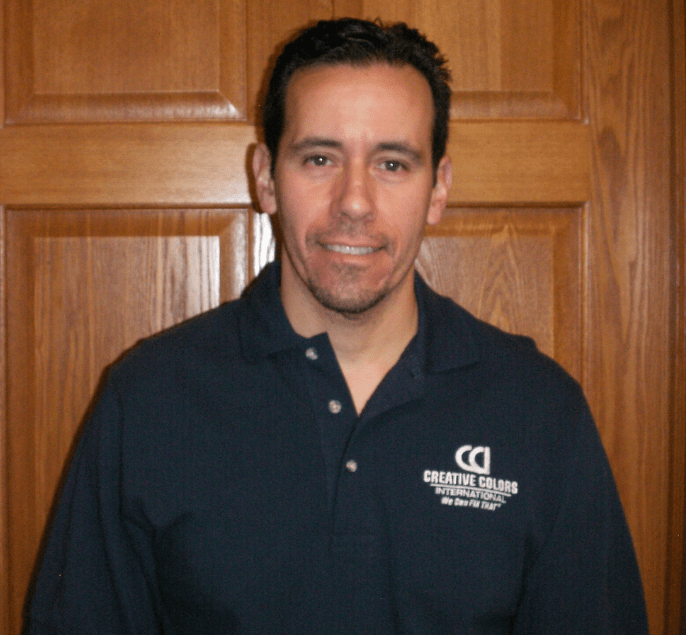 Profitability is high with the executive model and Edgar is motivated by the idea of growing and developing his franchise to be the biggest and best it can be. Whether he decides to leave corporate America to build his own empire or simply diversify his business interests, Creative Colors International executive-style ownership will be a venture that can bring a big payout that will secure Edgar’s retirement. Sam is not afraid of hard work. In fact, he has spent years putting in 60-hour-plus workweeks — so someone else’s company would be successful. Now, he’s been downsized! Ready to take control of his destiny and answer to only himself, he decides to purchase a single unit with Creative Colors International. Sam’s territory will consist of two trucks and will probably service a population of about 300k people. He enjoys doing the repair work himself and is happy to keep things small with only one or two employees. He sets his own hours and doesn’t have to hassle with upper management anymore. Revenues of approximately $250k a year allow Sam to live comfortably and still put something aside for retirement. Life is good. The beauty of owning a Creative Colors International franchise is that it can be tailored to the executive-style owner or the man-in-a-van. Some franchisees start small and find they want to expand. CCI serves nearly 50 different types of businesses ranging from the auto, RV, and marine industries to restaurant, furniture and medical industries. The growth opportunity is almost limitless. Both new markets and expansion markets are currently available. Visit us today to learn how you can thrive with CCI! Three Key Elements to a Recession-Resistant Franchise, like CCI! 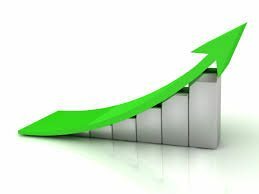 ed to increase by more than six percent this year, to hit $451 billion in gross domestic product. 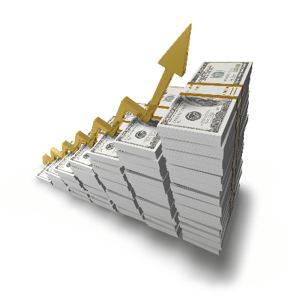 Here at Creative Colors International, we appreciate the current economic climate but know nothing lasts forever. Bollman has been with the company through four recessions in the last 26 years, and the company has continued to grow and thrive. Even during the Big Three Bailout of 2008, when automotive customers — our bread and butter — were lost and others consolidated, CCI weathered the storm. We prefer the term recession-resistant to recession-proof because there will always be economic factors beyond your control. Here are three key elements to consider when searching for a recession-resistant franchise opportunity. Farmers do it with their crops, and we do it with the industries we serve. Diversify. Although the automotive industry, both new and used car dealers, is a key business segment, they are by no means our only customer base. Boats, planes, trains, really any form of transportation, as well as furniture, office spaces, restaurants, and hospitals can all use our restoration and repair services. Incidentally, service businesses are generally considered recession-resistant when they can offer customers the option of repairing over buying new. 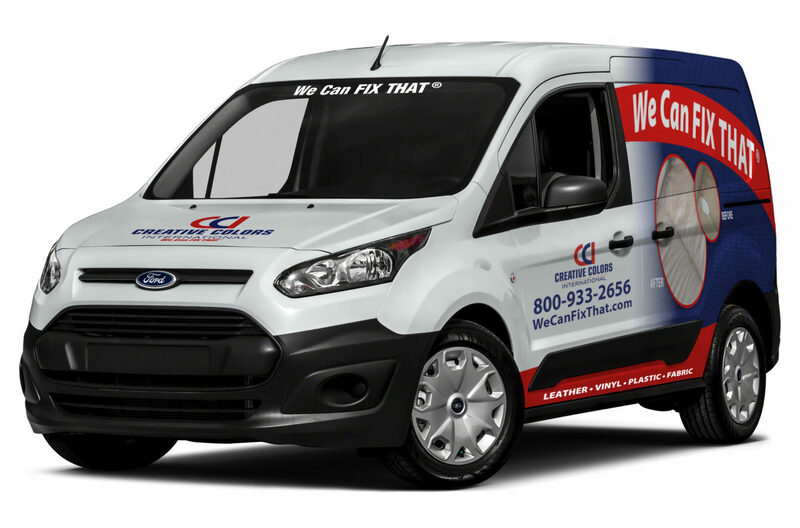 That puts us in a pretty sweet spot, as CCI can offer most clients an 80–90 percent savings in repairing over replacing. We have seen first-hand that when orders with some industries sag, others will spike. Because CCI serves a diverse number of industries, our overall portfolio remains balanced, even in cyclical valleys. After all, there are very few places you can go where you are not sitting on or touching leather, vinyl, fabric or plastic. In every community, there will always be a need for our services. We’re talking about revenue streams here. It takes diversification one step further. At CCI, we have made a concerted effort to create additional revenue streams by going after two different markets, B2B and B2C. In our B2B segment, we have created several programs to work as a subcontractor for companies who interface directly with the consumer. We make a product look new for their customer and they get the credit and a good profit, thanks to our special business pricing. Long-standing relationships with warranty companies have proven to be another great partnership. We even offer customized logo floor mats to auto dealerships as an add-on product. Our B2C market is growing, too, because, well, who doesn’t want to save money? In the past, we have been behind-the-scenes, but now, with an aggressive social media presence, we have found ways to create and capitalize on awareness with end-users. 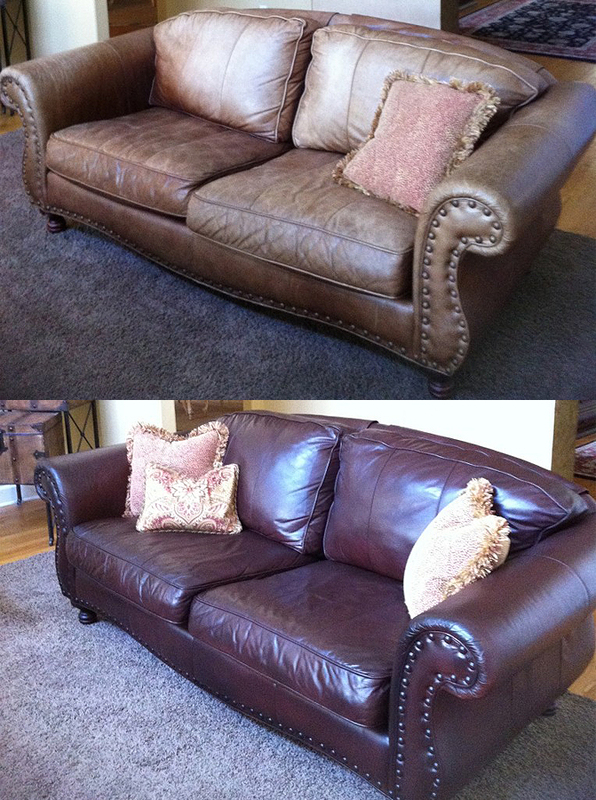 If we can save them hundreds of dollars on a repair of their couch or favorite recliner, they will be repeat customers. We offer leather care kits and have started upselling our own certified reconditioning programs — all additional sources of revenue. Our reduce-reuse-recycle business philosophy and use of “green” water-based products also resonates with today’s consumers. It’s not just for cell phones. We are an on-the-move society, so having an on-the-move business is a great choice. 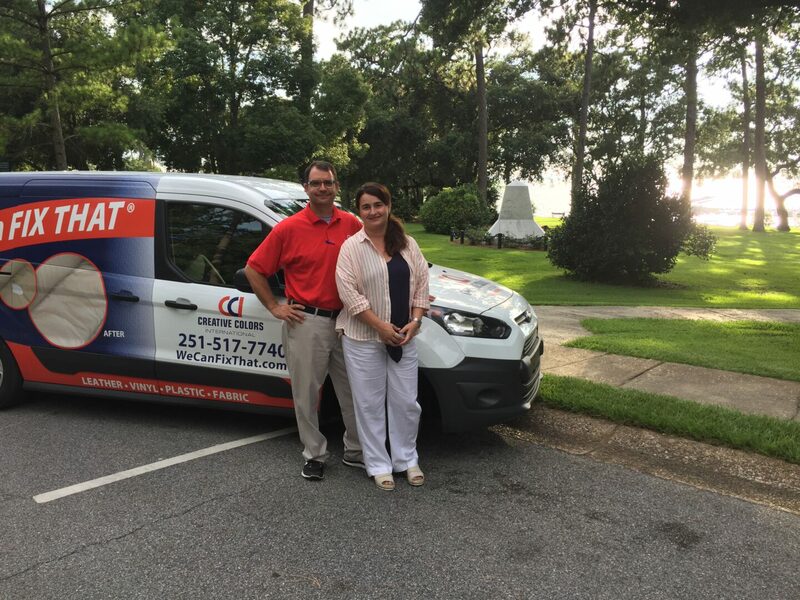 At CCI, the van is our mobile office. It comes delivered to our franchise owners fully stocked and outfitted. Right off the bat, you save a big chunk of change by forgoing rent, utilities and all the expenses associated with a brick and mortar storefront. That’s more money in and less money out. Another reason service businesses are thriving today is that more and more of them are going with a low-cost mobile business model and reaping the rewards of being able to go directly to the customer instead of waiting for busy consumers to walk through their door. The businesses that offer convenience and comfort in addition to quality and value will be the ones that get repeat business and word-of-mouth referrals that will weather any economy. The keys to making it through a recession begin in an up-economy, like now. Keep your eye to the future and begin building that diverse customer base. When you lose one customer, challenge yourself to replace it with three new ones, and try to make them from different sectors. 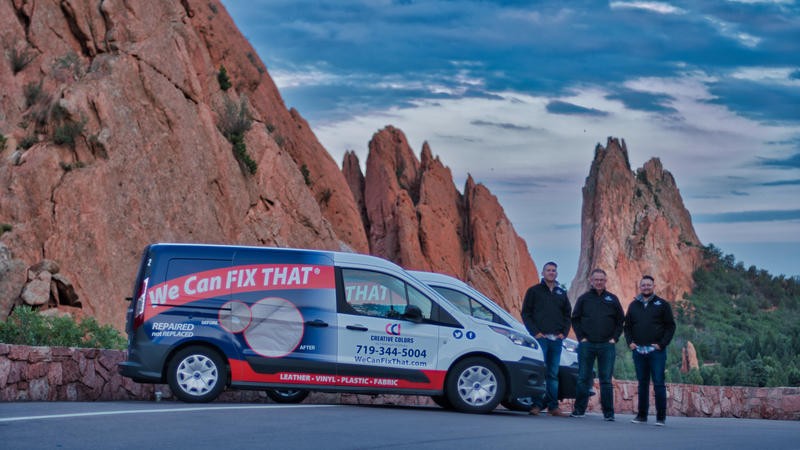 It is not uncommon for our CCI franchisees to serve upwards of 70 different vertical markets. Even in a recession, people will still have needs and if you can be there for them and save them money, your business is sure to experience more peaks than valleys. Are you interested in learning more about joining the CCI family and taking advantage of this recession resistant business model? If so, get started by visiting https://www.creativecolorsintl.com/franchise-opportunities/request-franchise-information/. (Irvine, CA – April 27, 2018) — Creative Colors International, the nation’s leading on-site repair and restoration franchise, will launch its newest location on May 7, in Irvine, California. This is big news as more local business owners and cost-conscious residents than ever before are seeking out alternatives to astronomical upholstering charges and replacement fees associated with damaged possessions that are made of leather, vinyl, plastic and fabric.